More than 100 people have been killed in Iraq in apparent revenge attacks after the bombing of a key Shia shrine. Scores of bullet-riddled bodies have been found in Baghdad, while in the bloodiest attack 47 factory workers were killed near the capital. President Jalal Talabani called an emergency summit of Iraq's political leaders to discuss the violence. Sunni Arab politicians boycotted the meeting and pulled out of coalition talks in protest at reprisal attacks. "We are suspending our participation in negotiations on the government with the Shia Alliance," said Tareq al-Hashimi, a top official from the Iraqi Accord Front, Iraq's main Sunni Arab alliance. The Iraqi government has announced a daytime curfew in Baghdad and the surrounding provinces for most of Friday - in a bid to help maintain order around the period of prayers. Dozens of Sunni mosques have been targeted and several burnt to the ground since bombers blew up the golden dome of the revered al-Askari shrine in Samarra on Wednesday morning, reports say. In a rare public rebuke, the main Sunni religious authority - the Association of Muslim Scholars - accused Iraq's top Shia cleric, Grand Ayatollah Ali al-Sistani, of fomenting the violence. Ayatollah Sistani has urged Shias not to attack Sunni mosques, but a spokesman for the cleric said anger might be hard to contain. "You wouldn't expect an abrupt or sudden calm, because there are some people whose reaction you can't control," London-based Fadel Bahar al-Eloum told the BBC. The Iraqi government cancels all police and army leave and extends the curfew in Baghdad. As violence showed no sign of abating, Iraq's leaders have increasingly warned of the dangers of a civil war. After meeting Shias, Kurds and leaders of a smaller Sunni group, President Talabani said in a televised broadcast if all-out war came "no-one would be safe", Reuters news agency reported. The attack on the al-Askari shrine - which will be seen as a direct assault on the identity and rights of an entire community - takes the danger of a civil conflict to a new level, the BBC's Middle East editor Jeremy Bowen says. A civil war would destroy the chances of the elected Shia-led government which is still being formed following December's election, and could lead to the break-up of the country, he says. In the heaviest single loss of life, the 47 factory workers were killed after being dragged out of their vehicles in Nahrawan, on the outskirts of Baghdad. The victims, aged between 20 and 50, had been travelling home from work in a convoy of buses when they were ambushed and shot dead. It is not clear whether the murders are linked to the attack on the shrine or whether they are part of the general insurgency. Elsewhere, the bodies of a prominent al-Arabiya TV reporter and two of her crew, who had gone to cover the attack on the shrine, were discovered on Thursday morning. 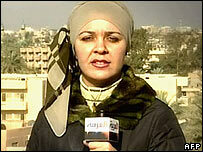 Correspondent Atwar Bahjat's body was among the three found about 15km (10 miles) north of Samarra. At least 12 people died in a bomb attack on an Iraqi army patrol in the town of Baquba, while one person died in a gun attack on a Sunni mosque in the city. In other attacks, four US soldiers were killed near Hawijah, while three died near Balad, when their vehicles were hit by roadside bombs, the US army said on Thursday.